the PIM team would like to sport a fancy website for Kontact to better market it as a product on its own (similar to what Krita or Digikam do). I borrowed the "Aether" design from @kvermette and created an initial version of the webpage, you can see the live devel version here: http://kontact.dvratil.cz/index.html (and the git repo is here). 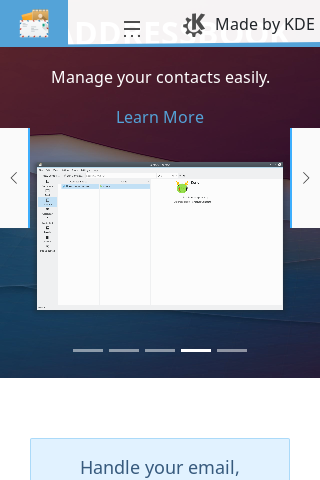 I'm working with the KDE Promo team to polish the content, but I'd also like to ask you guys for help regarding the design. I don't want you to design the whole website or to create anything special for us (I actually quite like that our page loks similar to kde.org), but I'd like to get some general feedback regarding the visuals, layouts etc. I love it! I have nothing to add. Have we tested this site on mobile? Thanks Andy! It should all be responsive. "you can follow this Flatpak HOWTO and build it yourself. " The website is live on kontact.kde.org now, so I think we can close this task, thanks everyone for your input and help!